How can I learn the basics of trading with EXANTE Trading Platform? Do you provide any tutorials? What happens when I create an order? What is your trading technology based on? Where can I find the list of companies you are partnered with, when it comes to executing trades? If you wish to learn how to use EXANTE Trading Platform, you may turn to our detailed User Manual that can be found in our client's area. The video tutorials feature subtitles in several languages, including English and Russian. The channel is also regularly updated with trading webinars hosted by prominent traders who share their knowledge about the latest market trends and successful trading strategies. It all starts with you as a client. You can either make an order via our trading platform or an API, or turn to our Tradedesk for specific over-the-counter instruments. In both cases the order goes directly to the market, be it an organized stock exchange or an OTC marketplace. As a result of your successfully fulfilled order, you obtain real assets against your deposited funds. At the heart of EXANTE’s trading technology is the multifunctional in-house developed EXANTE trading platform. EXANTE team developed the trading platform from scratch without using third-party solutions, which, firstly, guarantees it’s fast and reliable performance, and secondly, makes EXANTE platform very versatile and easy to support. 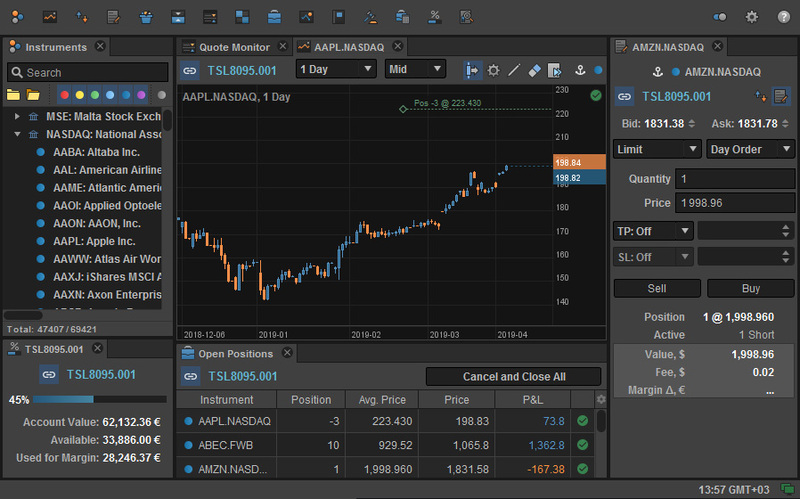 We also offer solutions for algorithmic trading based on FIX 4.4 protocol. Our trading scheme is rather complicated: we can work with one company to trade stocks, while trading, say, futures on the same market will involve another counterpart. The full list of our partners is constantly changing, as we are always looking for the most efficient connections to the markets. We cherish our infrastructure as it is a significant part of our business that could be copied and misused once disclosed, so we tend to keep our partner connections unexposed to the public. You may, however, rest assured that the logistics do not affect the conditions and commissions in any way. EXANTE remains one and the only counterpart for our clients when it comes to trade execution.